Waterfalls and water features give your landscape that picturesque look, and that relaxing feel. There’s nothing quite like listening to water bubbling and gurgling its way through a fountain. 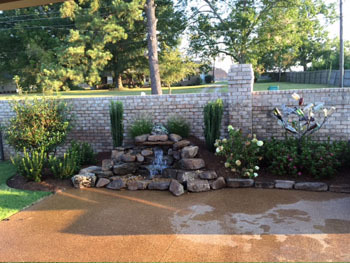 When you want a water feature seamlessly integrated into your landscape, call Jeff Fuller Designs at 731-630-4739. Jeff Fuller Designs has experience with installing traditional pondless water falls, fountains, and more modern water features. View a sampling of our water features and waterfalls here.